Scrambled eggs for dinner doesn't mean you have bad timing. Just add a few simple ingredients and they become a delicious and sophisticated light main course. I've always loved Robert Frost's line about home being the place where, "when you have to go there, they have to take you in." Perhaps I'm putting an overly optimistic reading on it, but the idea that even on our coldest, darkest nights, there is always a place with a warm light in the window is reassuring. That's kind of the way I feel about having eggs in the refrigerator. It doesn't matter how gruesome the workday has been or how late it is when I get home, give me a couple of eggs and some of this and that from the fridge and I know I can fix a meal that will not only get me through the night, it will even redeem the day. Yet it seems like every time I mention eating eggs for dinner, I get met with a blank look — "Dude? You don't know those are for breakfast?" — or even worse, pity — "So, at long last it's come to this, has it?" But while I'll happily acknowledge the rules-turned-upside-down pleasure of eating things like waffles and pancakes for dinner (or pizza for breakfast! ), that's not at all what this is about. These are egg dishes that make perfect sense as light main courses. Better yet, throw together a quick salad and you've got a complete, elegant meal that can probably be prepared in less time than it would take my big pasta pot to come to a boil. Of course, there are omelets and frittatas. Those are easy answers. Eggs, cheese, a few bits of vegetables and you're there. But you don't even need to get that complicated. You're going to have to trust me on this, but one of my favorite late-night dinners is scrambled eggs. 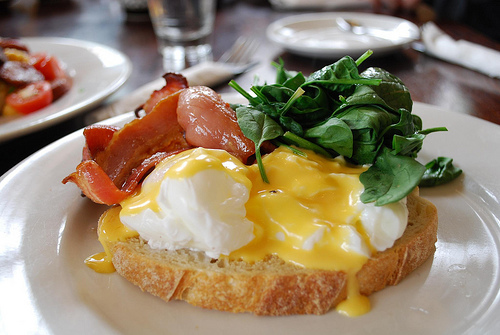 These aren't your typical diner eggs, though. They're more like the ones you get at great restaurants, only there you usually get them elaborately piped back into their shells and garnished with caviar or truffles. In restaurants, these are cooked long and slow, often over a double boiler, with some poor little commis standing there sweating and whisking the whole 20 or 30 minutes until the eggs are set. The result is glorious — rich and creamy eggs that are more like a slightly curdled hollandaise than what Andy brings to the counter with a couple of slices of bacon. Several years ago I came up with a trick that makes them really easy to prepare at home. The secret is butter. Cold butter, specifically. Here's the deal: The trick to getting that creamy texture in scrambled eggs is monitoring the heat really carefully. The proteins in eggs begin to set at a relatively low temperature, about 150 degrees (that's roughly correct — the whites and yolks set at different temperatures). And once they start to set, they get very firm very quickly. One way to get around this is by whisking them constantly over very low heat, or you can just outsmart the proteins. 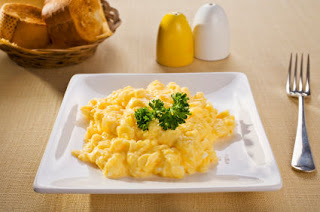 The way I fix scrambled eggs, I add just a little bit of cold butter to the raw eggs and start cooking over medium-low heat. You do need to stir constantly — a wooden spoon or a silicone spatula is perfect. Keep the eggs well agitated and in a couple of minutes, when you can feel them getting thick and see them looking creamy (fun fact: that's the proteins unfolding and blocking the light), start beating in little cubes of cold butter, a few at a time. Adding the cold butter moderates the temperature, keeping it just below the point at which the eggs will actually set. Oh, and the butter also emulsifies into the eggs, making them absolutely delicious. The eggs will be done when they have formed tiny, creamy curds. Some people (like my wife) don't like their eggs too runny; for them you can go just a little longer. Whatever your preference, take the eggs off the heat while they still look a little too moist. They cook so quickly they'll firm up more in the couple of minutes that you're dishing them up. If you have caviar or truffles languishing on your counter, by all means use them for garnish. I usually use just a couple of pinches of minced fines herbes (a mix of any or all of parsley, tarragon, chervil and chives, varying according to what I have on hand). And I have to say that, in a pinch, a good grinding of cracked black pepper cuts the richness deliciously. Another favorite dinner is based on a recipe for eggs fried in bread crumbs that I learned from my old friend Judy Rodgers. For years this was my standard order when I'd stop by her Zuni Café in San Francisco for Sunday breakfast. And they're even simpler to make than scrambled. Put a generous handful of fresh bread crumbs in a small bowl (I've tried this with dried bread crumbs and with Japanese panko bread crumbs, and fresh works best). Stir in some chopped fresh thyme and just enough olive oil to moisten them nicely. Cook the bread crumbs in a skillet over medium heat until they begin to toast. You'll see the color change from pale to light tan, and you'll also hear the change as the crumbs crisp and sizzle when you stir them. Gather the crumbs into two low mounds that are as near to a single layer as you can manage, and then immediately crack an egg over each mound (this recipe can multiply out for as many eggs as you want to make, but I find four eggs is about the most that will fit in a 9-inch skillet). Cover the pan and, if necessary, adjust the heat so the eggs cook evenly without scorching around the edges. When the yolks are as firm as you like (they really should still be runny but thickened), transfer the eggs to a plate and quickly sizzle about a tablespoon of vinegar in the pan to free up any stuck crumbs or bit of eggs and pour that over the top. This is the epitome of subtle sophistication. Simple ingredients are cooked in a smart way to get the most out of them. 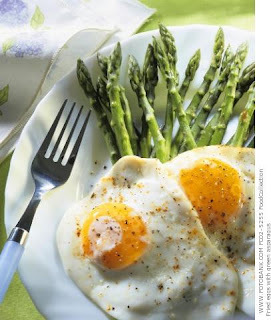 The toasted bread crumbs add crispness to the eggs, and the vinegar finish keeps them from being too rich. Serve it with just a tart salad, but at this time of year, when I seem to be eating as much asparagus as I can hold, it's even better with the egg laid languorously over a bundle of steamed spears. It's a simple thing, really just fancy fried eggs, but knowing I've got this waiting for me when I get home, I don't care how my day has gone or how long my commute might be — how dark the world might seem at the moment — there is a light shining at the end of the tunnel.